One of the most frequently asked questions I receive is "who was Tunney", referring to the "Tunney" of the well-known geographic reference point "Tunney's Pasture". Considering that the Tunney name is attached to Ottawa's largest government complex, one of the transportation system's key stations, and often even the surrounding neighbourhood, little is actually known about Tunney himself. So the goal of my blog article today is to go back in time a long ways, and dig up details on a relatively obscure person from Kitchissippi's past. You might be surprised to know that Tunney didn't operate a farm that was all too large. Nor did he operate it for all that long a period. And on top of that, the Tunneys did not even own the land on which the "pasture" existed. The story begins way back in the 1800s, when vacant land alongside the Ottawa River was passed from owner to owner, with little happening in the way of development. Lots 35 and 36 of Concession A, Ottawa Front, in Nepean Township, were granted together in 1801 to Jennet Strothers, daughter of United Empire Loyalist Finlay Grant. 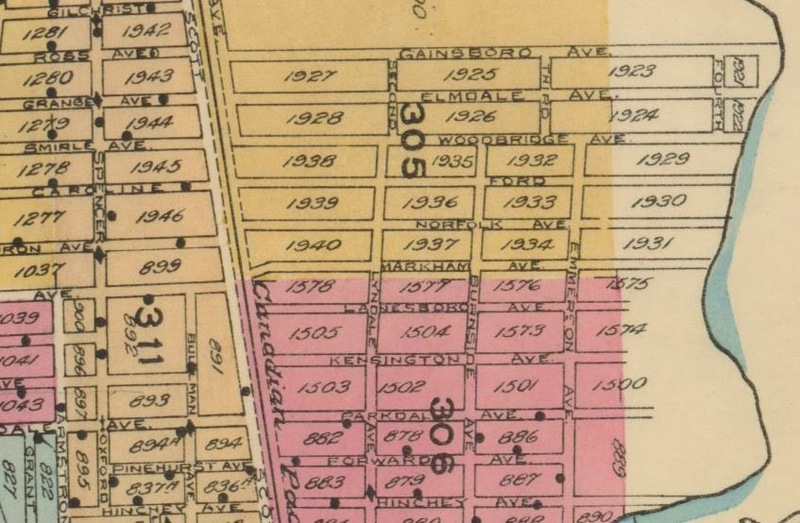 These lots comprised all of the land north of what is now Scott Street to the River, between approximately Goldenrod on the west and Stonehurst Avenue on the east. all land south of Scott is "Concession 1"
The land was owned for a time by Nicholas Sparks (the Nicholas Sparks, who owned much of central Ottawa), later Nicholas Sparks Jr., and later sold to the real estate prospectors who subdivided Mechanicsville. In 1874, those same prospectors (Baldwin and Blasdell) sold a good portion of the land (including the unsold Mechanicsville lots) to a group of major Ottawa lumber merchants, who wished to own control of the river shoreline. The group of men included a who's-who of Ottawa lumber barons: Philip Thompson, G.B. Greene, John R. Booth, Levi Young, and the firms of Bronsons & Weston and Perley & Pattee. This syndicate was also known as the Ottawa Lumber Merchants' Association. The Association would sit on this large parcel of land from 1874 until 1896. During this period, they themselves would do absolutely nothing with the property (other than continue to sell the already subdivided lots in the burgeoning Mechanicsville suburb). However, one of G. B. Greene's employees was a young labourer named Anthony Tunney, who happened to live on Fifth Street (now better known as Parkdale Avenue) in Mechanicsville. Tunney was one of the first purchasers of land when the Mechanicsville subdivision had been first laid out in 1872. Though he purchased lot 16 on Fifth Street sometime in 1872 or early 1873, it was a year later that he constructed a small wood-framed home on the lot. The 1874 assessment rollbook for Nepean Township lists the five members of the Tunney family as residing in the small home, but notably, with no animals at the time. the first published proof of Tunney's livestock! Interestingly, many sources that I consulted often mis-spelt Tunney as "Tinney", not an illogical misspelling if you consider an Irish pronunciation of "Tunney" (particularly as most data-collectors of the era simply wrote names as they heard them - any of you genealogy researchers who have spent hours delving into old census records, voters lists and the like will know what I mean). Between 1875 and 1901, Anthony Tunney continued to own a mix of cattle, sheep and horses, but (according to assessment records), never more than a few of any of them at one time. Livestock in fact was not even his primary employ; he continued to work as a mill hand during this period. His employers were both G. B. Greene (who was the general manager of the Upper Ottawa Improvement Company), and the Lumber Merchants' Association. As an employee of the Lumber Merchants' Association, one of his roles was as "caretaker for the empty fields of lot 35" (according to an article from 1955 written by Dr. H. T. Douglas, then librarian of the Historical Society of Ottawa). The article goes on to note that "the pasture-land between the river and the railway (the Transitway today) was lying idle, and so Anthony Tunney was allowed to pasture a few cows and horses of his own on the land...During the Summer, Tunney's cows produced more milk than his own family required and gradually he built up a moderate dairy business. It is also recalled that Butterworth Coal Company would pasture its horses in Mr. Tunney's care." It was not only Tunney himself who used the land for livestock. According to a newspaper article from 1952, Anthony Cody, a grandson to Anthony Tunney, reminisced that "the pasture held animals owned by his horse-fancier and very Irish grandfather Tunney. Sections of it were rented to other people in different parts of Ottawa for their cows and it was a great spot for picnics, bonfires and such." Dr. Douglas further noted: "Later on, he was given a free hand with the property by virtue of paying the tax-money direct to city hall." This is an important fact to note, as it appears that Tunney could have been signed over ownership of the vast (and soon to be very valuable) piece of real estate, since he had making the tax payments on it, but for whatever reason, he declined ownership. Opinions on this detail seem to vary, there is really no true definitive answer on what options Tunney actually had. In September of 1896, the Lumber syndicate sold the land for $40,000 to the Ottawa Land Association (an equally as substantial syndicate of investors, who had already bought up a lot of the farmland in the area). Tunney continued to keep animals on the land for a few more years (perhaps with an unofficial agreement with the OLA folks), but it would be brief. The last year that Anthony Tunney appears listed as owning animals is in 1901. When the assessor visited him on March 15th, 1901, the nearly-60 year old Tunney still had one cow and one horse. However, a year later, on March 20th, 1902, Tunney was animal-less. 64 Lyndale Avenue in 2014. Built by Anthony Tunney circa 1891. 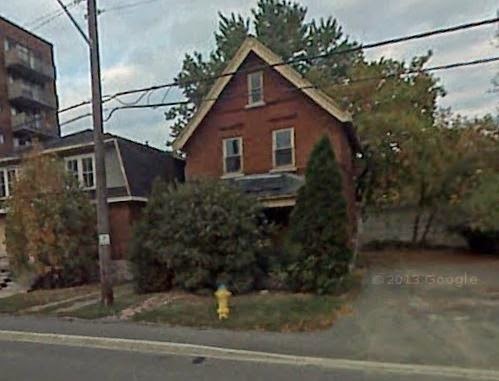 In 1891, the original Tunney family wood-frame home on Parkdale that overlooked "Tunney's Pasture" was burned in a fire. Anthony Tunney purchased two lots at the south-west corner of what is now Lyndale and Hinchey and built a home which still stands today at 64 Lyndale (and I would bet that the current owner/occupant isn't even aware they are living in a home built by THE Mr. Tunney!). Tunney kept ownership of his original lot on Parkdale. 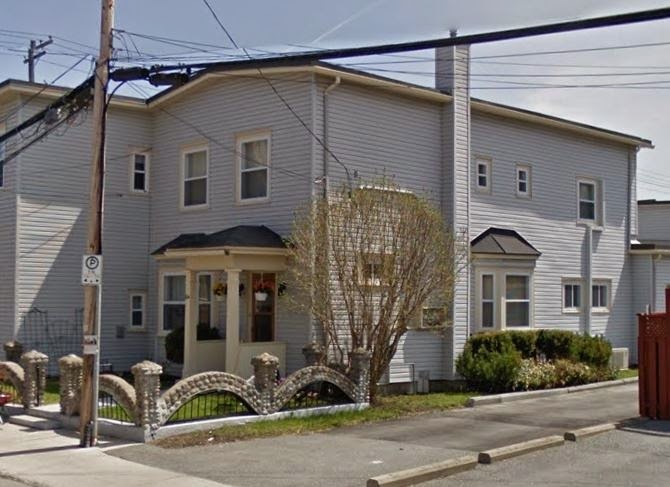 His son John James Tunney married in 1898 and had his first child, daughter Murial in February of 1899, and at the time constructed a new home on the original lot, at 201 Parkdale Avenue. This home stood until 2009, when it was razed to make way for the new Soho Parkway. Anthony Tunney passed away in December of 1915 at the age of 75. He passed with little ceremony or notoriety. In fact, I could not even find an obituary, let alone a longer article on his life (which was quite common to appear in the era when a citizen of Ottawa passed away). The man whose name and part-time job would be so closely associated to the community over the next 100 years had no idea how important his legacy would become. Following his passing, his son John James indeed did remain in the home at 201 Parkdale until he died in 1957. 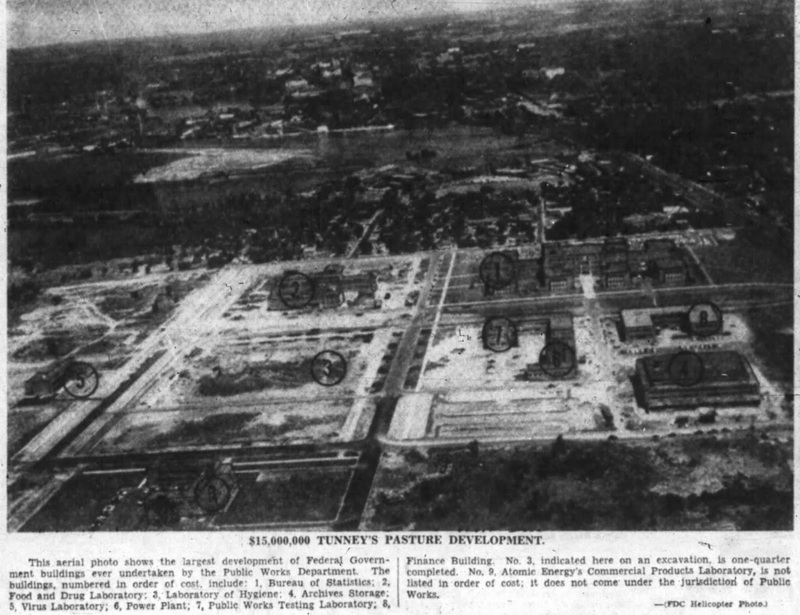 From 1902 until 1950, the Tunney's Pasture property more or less sat vacant. It is notable to point out that the property discussed above only went as far west as Goldenrod (the west edge of lot 35). Tunney's Pasture of course goes further west than that, to the back of the property lines behind Northwestern Avenue. 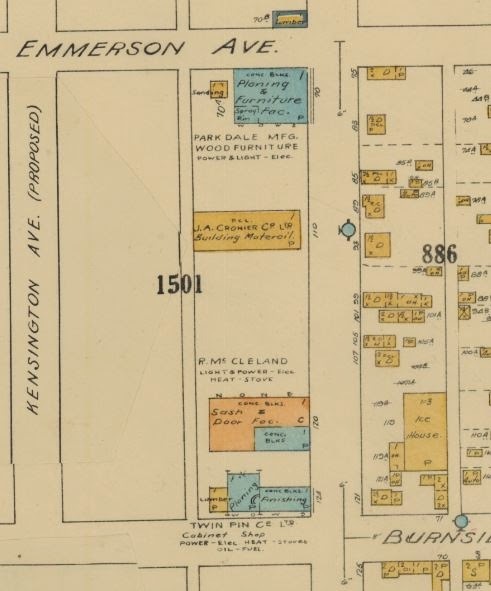 So it should be pointed out that in 1906 an abattoir company, the Ottawa Stock Yards and Abattoir Company Ltd. purchased most of lot 34 in concession A. (I'm intentionally avoiding adding much detail at this point as Eldonwood itself is interesting, and worth a blog post on it's own, which I'd like to get to someday!). Though a few lots were sold and some houses were built (almost exclusively at the west end on Gainsboro), the subdivision was largely a failure, and within a few years, discussions were heating up about how the City could maximize the use of the large parcel of central land. 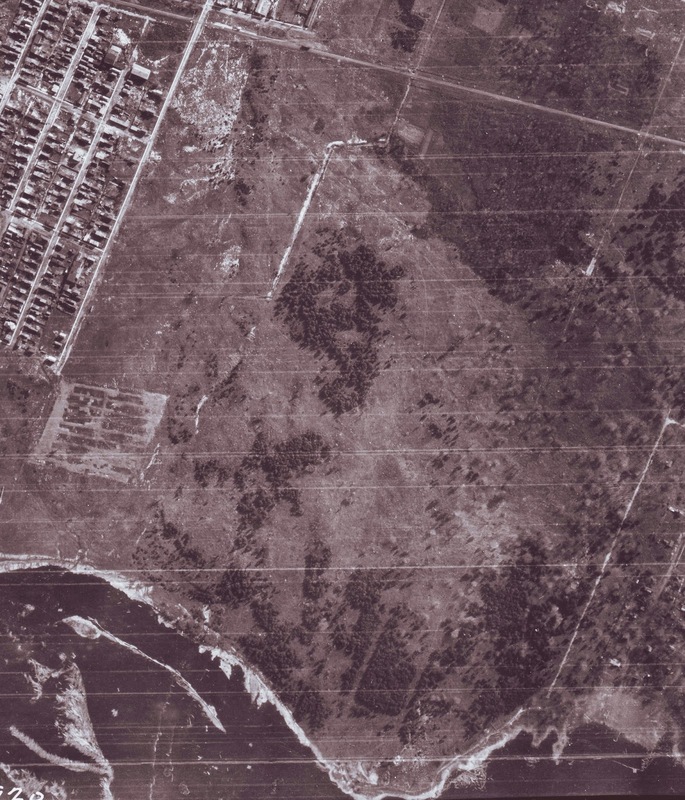 The aerial photo below is of the Tunney's Pasture property in 1920. The CP Rail line (Scott Street) can be seen running left to right at top. Mechanicsville is at left (the thicker white line is Parkdale). At the bottom right you can just see the Champlain Park subdivision; Northwestern is the thicker white line going to the River). Your guess is as good as mine as to any of the land features in this photo. (That is definitely a creek running from above Scott Street down to the river). The property overall is mostly a rocky, empty space, with a few patches of trees. the center. Burnside at the bottom, Emmerson at the top). 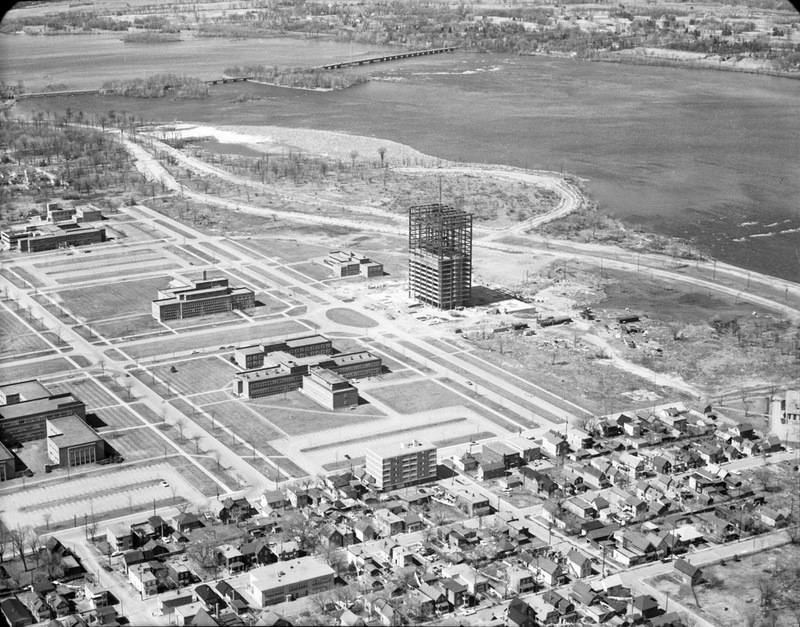 In 1947, the federal government expropriated the 113-acre Tunney's Pasture property, with settlements for the former property owners reaching up to about $700,000. Work began in the summer of 1950 to excavate the rocky property. "Only a thin film of scratchy sod and sun-dried moss covers the rock" mentions the Ottawa Journal in an article on the excavation work. An editorial also adds "Houses are springing up like mushrooms between Scott and the Richmond road, and beyond the railroad tracks over to the river. 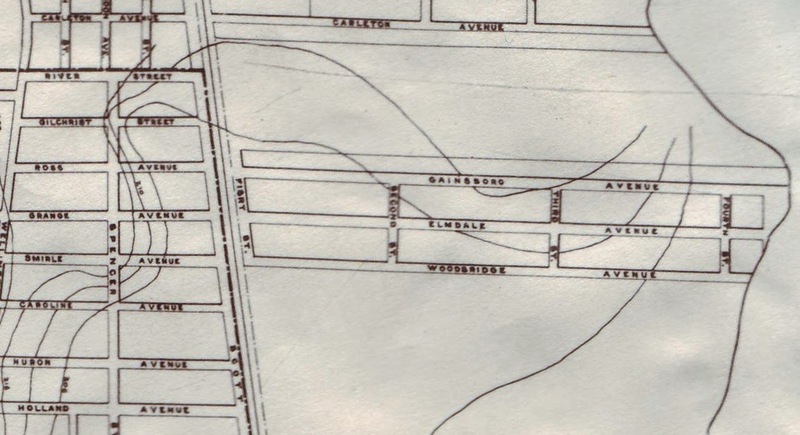 The exception was a block of rocky and barren land, stretching north from the tracks to the river, and from Parkdale avenue to Gainsborough street. This area is known as Tunney's Pasture, and the original Mr. Tunney must have had a hardy breed of cattle to find sustenance in so unpromising a field." 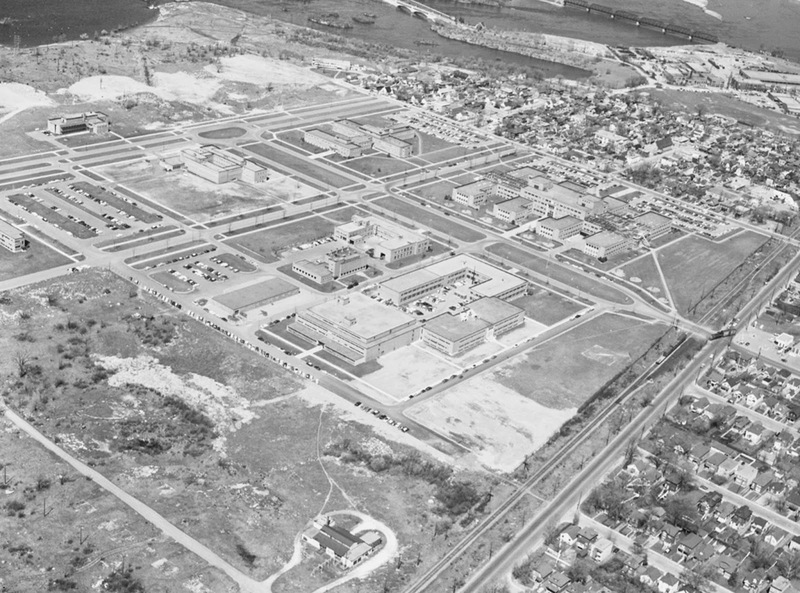 The first four buildings constructed were: (1) the Power Plant Building (Public Works): started November 1950, plus addition completed early 1956. Total cost of $806,245; (2) the Virus Laboratory (Dept. of Health): started December 1950, completed November 1954. Cost $943,243; (3) the Financial Building (Dept. of Finance): started December of 1950, completed March 1953, cost $450,980; and (4) the Bureau of Statistics Building (Dept. of Trade): started January 1951, completed March 1953, at a cost of $5,889,000. I hope you enjoyed this rather quick history of the Tunney's Pasture property. I glossed over a lot of the post-1920s details, as I wanted to focus more so on the Tunney name itself. Rest assured, at some point in the near future, I'll cover those proposed Tunney's Pasture subdivisons and developments in greater detail. Cheers! Someone, who I HAD trusted, had told me that the StatsCan building was originally a hospital built just after WWII. From the shape, size and various features (particularly the basement) it was easy to believe that. Now I find out that it was StatsCan from the beginning. Kind of disappointing, because it doesn't have a more interesting history, and I clearly can't trust the acquaintance who told me that. Enjoying the blog quite a bit - fond memories of my time on Forward Ave. I hope I'm not the acquaintance referred to above, because I've told the hospital story myself. My source is Duncan McDowall's "Sum of the Satisfactions", a history of the System of National Accounts (and much of Statscan in parallel). According to the book, the Main Building also has a bit of a ghost story. I hope you can dig into this. Grew up on Stonehurst Ave. Rented 201 Parkdale in the early 1960's. Never knew that Mr. Tunney didn't own the pasture. Played in that field from time to time. Enjoyed your blog. Like your blog, I use to live at 84 Carruthers and my ant and uncle (my mom side) lives at 64 Lyndale and yes, they do know. they got the house from him. Also, my dad remembered playing in the pasture and telling me about the creek. He saw the building at the far end being built. Nearly everyone knew everyone in Mechanicsville. Incase anyone reads this, I'm from the Dionne family. Interesting article Anthony and Maria are my 3xgreat grandparents. Anthony Tunney is my great-great grandfather. My name is Bernadette Cody. My father is Patrick Cody. His father is Goldwin Joseph Cody. His father is David Patrick Cody who married Maria Tunney. Maria Tunney is Anthony Tunney and Maria Devereux's daughter. Where do you connect?